As I’ve posted about many times, this sort of memory is a construction, often in flux, showing the effects of selective attention, expectations, and later experience (including things you’ve heard about). 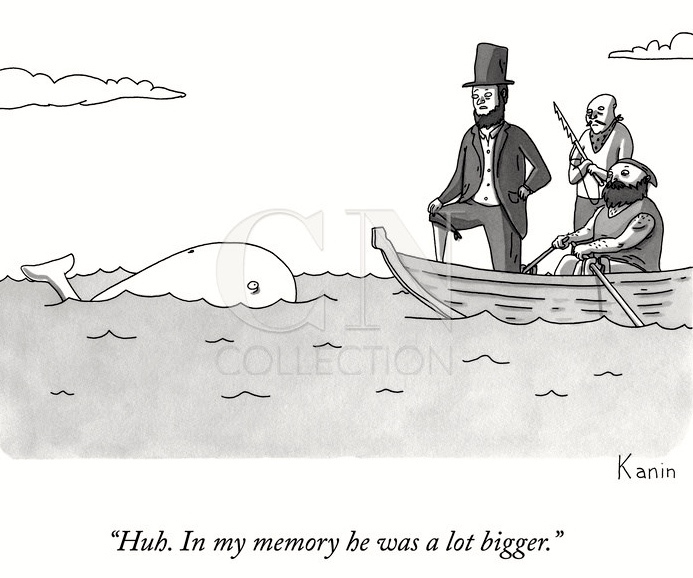 The white whale loomed big in (this) Captain Ahab’s mind, and so in his memory. Now the title of this posting, the first line of the song “As Time Goes By”. “As Time Goes By” is a song written by Herman Hupfeld in 1931. It became most famous in 1942 when part of it was sung by the character Sam (Dooley Wilson) in the movie Casablanca… It has been used as a fanfare for Warner Bros. since 1999 and was the title and theme song of the 1990s British comedy series As Time Goes By. Lionel [Palmer] and Jean [Dench] were young lovers until accidentally losing touch. Years later they meet again by chance and unexpectedly rekindle their romance. I’ve written a brief appreciation of Dench here. Palmer deserves his own posting — but not today. In both these contexts, the song refers to the reunion of lost lovers and the rekindling of their romance. This entry was posted on October 12, 2015 at 2:05 am and is filed under Linguistics in the comics, Memory, Modality, Movies and tv, Music, Semantics. You can follow any responses to this entry through the RSS 2.0 feed. You can leave a response, or trackback from your own site.